OCEANSIDE — The Ironman 70.3 California will bring 3,100 top athletes together to swim, bike and run to the finish line April 2. Racers start with a 1.2-mile swim inside the harbor, with water temperatures expected to be in the 60s. Then triathletes bike 56 miles through scenic Camp Pendleton. The race ends with a 13.1-mile run along The Strand, out onto the pier, down and back Pacific Street and a finish at the pier amphitheater. Triathletes have eight hours to complete the race. Best finish times are under five hours. “It’s not about beating the elements it’s about beating time,” Gina Thomas, race director said. A $60,000 total prize purse is awarded with $12,000 given to the first-place finisher. Among top professional athletes signed up for this year’s race are Andy Potts, Lionel Sanders and Taylor Reid. All three are from the U.S., and Sanders and Reid are from California. Potts won four out of five 70.3 races in 2013, and took first in the 70.3 U.S. National Champion in 2014. He placed second in last year’s Ironman 70.3 California at 3 hours, 48 minutes. Peak women athletes include Heather Jackson, Alicia Kaye, Amanda Stevens and Mary Beth Ellis, all from the U.S.
Kaye grew up and began racing in Canada. She started competing for the U.S. after she met her now husband, Jarrod Shoemaker, who is a U.S. triathlete. Kaye placed second in the Lifetime Series in 2011 and again in 2012. She went on to win the Lifetime Series in 2013 and 2014. In 2013 she also won the Toyota Triple Crown. 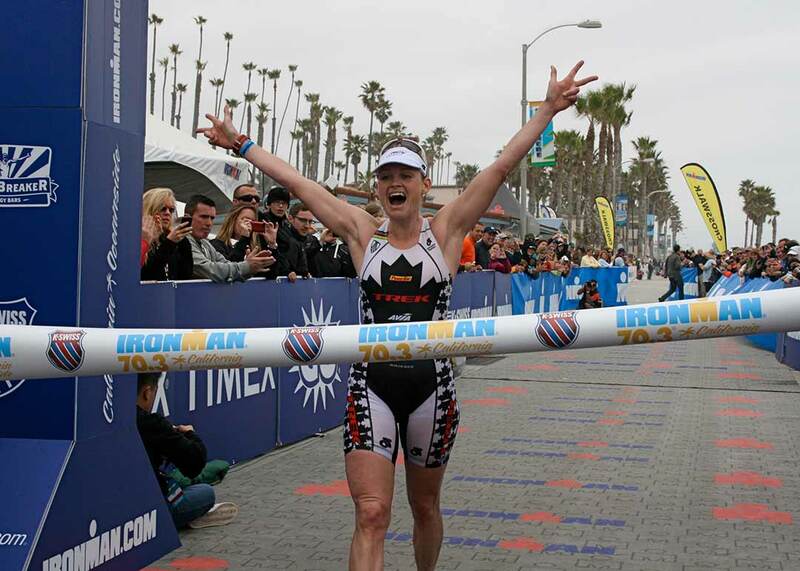 Last year she placed fourth for women in the Ironman 70.3 California at 4 hours, 20 minutes. One competitor for Kaye to beat is Jackson, who placed first for women last year at an amazing 4 hours, 14 minutes. Recommended viewing spots to see Potts, Jackson, Kaye and fellow athletes are by Pelican Deli Mart in the harbor, along Harbor Drive and on The Strand. The first Oceanside Ironman was held on Camp Pendleton in 2000. The race became the Ironman 70.3 California in 2002 and continues to use Camp Pendleton for the bike portion. About 84 percent of competitors travel to Oceanside for the triathlon and stay in town for the week. From Thursday through race day an Ironman Village is set up at the pier amphitheater for athlete check in, information and sporting goods sales. On Friday the Ironkids California Fun Run is held, with competitors as young as age 2. The popular race takes an army of staff and volunteers to ensure things run smooth. Shuttle service from Civic Center Drive and Coast Highway 101 brings athletes and spectators within walking distance of the start line at the harbor. No drop-offs by vehicles are allowed at the harbor because of safety concerns. Swim heats begin the triathlon April 2 at 6:40 a.m. The race wraps up with an awards ceremony at 4 p.m. For more information, go to ironmancalifornia.com.